Much excitment for the start of World Cruise 2011. 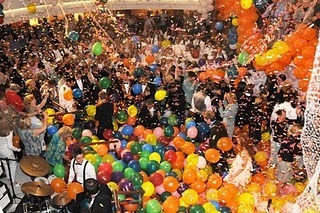 We all gathered in the Crystal Cove for the big BALLOON DROP which signifies the offical start of the World Cruise. The guest line the Cove and the Crew walk down the stairs into the middle and they drop hundreds of mutli-coloured balloons onto us which we take great pleasure in popping!! 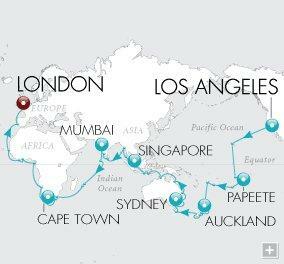 This is where we are going - amazing to think that we can travel all that way with stop overs in beautiful places, have the time of our lives and all in 3.5 months!